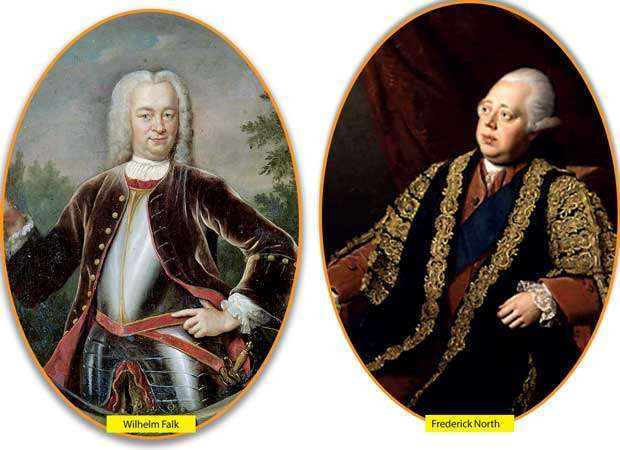 In 1766, the Dutch Governor of Ceylon Wilhelm Falk signed an agreement with King Kirthi Sri Rajasinghe. According to the terms of the agreement, known today as the Treaty of Batticaloa or the Hanguranketha Treaty, the Kandyan Kingdom had to pay five million florins to the Dutch as reparations and the King had to acknowledge the imperial authority of the Dutch “four miles from the coast to the countryside.” The Kandyans considered the terms onerous, and they began to search for a foreign power that could help them expel the imperialists. 30 years later, British emissaries ousted the Dutch. In hindsight, though, resorting to the British was a mistake, since Dutch power was waning and Britain was becoming the most powerful industrial nation in the world, a position later confirmed by its victory in the Napoleonic Wars. The British administration of Ceylon had to begin from the Maritime Provinces because these were under Dutch rule. What spurred the British more than anything else was the prospect of controlling the Trincomalee Harbour. They viewed Sri Lanka less as a Crown Colony than as a buffer colony with which they could control the sea route in the Indian Ocean. Their main concern was to bring the country under the East India Company. Two years after claiming it from the Dutch, they instituted a system of dual control where the Governor of the country would be responsible for law and order and the Director of the Company took control of all commercial matters. Dual control ended formally in 1802, with the signing of the Amiens Treaty. But North was in the minority, and for much of the period from 1798 to the 1830s, education policy in Ceylon was the subject of a debate between those who did not take much interest in instituting an education system and those who believed that it was the best way through which the natives could be converted. To appreciate the magnitude of this debate, it is pertinent to understand how the Dutch system operated. To begin with the Dutch were more tolerant than the Portuguese and the British when it came to the indigenous religions. They were less tolerant of Hindus and Muslims than they were of Buddhists, but this was only to be expected since they were not in a mood to offend the King of Kandy, the trustee of Buddhist rights in the country. On the other hand, they did not official expiate Buddhism, and temple lands confiscated by the Portuguese were not returned to Buddhist monks. When it came to the task of converting the natives, they exhibited a similar level of ambiguity: the Oostindische Compagnie encouraged people to convert to Calvinism, yet it did not go about this with the evangelical zeal that had marked out the Portuguese. In one area there was continuity from the Portuguese period: the link between conversion and education. The Dutch took over schools established by the Portuguese and added schools to churches. As stated before, schoolmasters were handed the role of registrars (“tombos”); Haris de Silva called the Dutch system an improvement over the Portuguese system, since it was more vigorously and efficiently enforced. The school tombo holders were part of a wider network of such registrars, on whom harsh methods would be used to ensure that registration was done to the satisfaction of the Company. By this method, the Dutch schoolmasters ensured compulsory attendance, remarkable and farsighted for its time given that “compulsory attendance” would not figure in the British scheme of things for more than a century. The Dutch school curriculum was simple, and it emphasised on the vernacular. (By contrast, the vernacular would be discarded by the British.) It was a simple system, with reading and writing and arithmetic as the other subjects. The undercurrents of proselytisation were evident throughout the schools as well, and in 1737, during the administration of Van Imhoff, a printing press was established in Colombo to make available copies of prayer books, the Gospels, and the Catechism in Sinhala. Under the governorship of Van Gollenesse the New Testament was translated to Tamil, an undertaking completed during the governorship of Jan Schreuder. But the effort taken by the Dutch to convert the population, especially the youth, to Calvinism was not totally successful. As with all such efforts, naturally, there was an unintended outcome: the spread of literacy in the littoral regions. (One problem which the British had to face was the literacy gap between the lowland areas, from the north to the south-west, and the highland provinces). Unlike the Portuguese and the British, furthermore, the Dutch became more tolerant towards the end of their reign; they campaigned against Roman Catholicism (which, in one sense, was more of a threat than Buddhism) and the indigenous religions, but the spread of literacy they facilitated merely served to raise the consciousness of the indigenous population. Such a liberal attitude had a say in the resurgence of Buddhism and the rebel sects that emerged at the end of Dutch rule: the Amarapura Nikaya, for instance, was founded in 1799, two years after the Oostindische Compagnie fell to the East India Company. The Dutch were less interested in conversion than in commerce. Under them cinnamon became the cash crop of the island; the Salagama caste, which Colvin R. de Silva referred to as the first proletariat class of Sri Lanka, was elevated to a preeminent position owing to their ability to peel cinnamon. Education for the Dutch consequently was, while being an instrument through which religion could be propagated, a means of elevating literacy. It’s inaccurate to suggest that they were moved by humanitarianism; they were simply more practical and less zealous than their predecessors. Because of this, even in the realm of language they could not equal the success of the Portuguese, the de facto lingua franca of the elite; so pervasive was Portuguese, in fact, that in 1835, one year before it was converted to a public school, the Hill Street Academy was established for the purpose of teaching English to children of prominent families, who spoke Portuguese Creole. The British reception of Dutch educational policies, as has been pointed out before, was mixed and ambivalent. Frederick North professed an interest in resuscitating the schools that had, after the Company took over, fallen into disarray. But he was in the minority, as subsequent events would show: “Nothing better could be expected from a commercial company” (Ruberu: 1969). Not until the Charter Act of 1813, which bore the definite stamp of the Evangelicals and Utilitarians, did the British in India consider it a responsibility on their part to look into the education of natives. Even that was a half-hearted attempt, which reflected calls for a coherent education policy. In Sri Lanka, such a call was not made. One reason was that the country did not contain the sort of exotic culture which could interest the Orientalists. But then, at a time when the Orientalists were dominating the education discourse in India, in Sri Lanka the Evangelical movement had fully taken over that discourse; Evangelism in Ceylon in one sense predates Evangelism in India. Moreover, no less a person than North considered Education and Conversion as interrelated priorities; his interest in maintaining the Dutch system was less motivated by humanitarian sympathies than by a need to promote a Western education in a Christian environment. Commerce having taken over the needs of proselytisation, this was not a popular view to hold, and with the dual control regime, the powers of the Governor were not on par with those of his Dutch predecessor for him to enforce his vision. Nevertheless, North tried to revive the Dutch system. The biggest problem he faced there was a lack of English clergymen, who alone had the will to re-establish Parish schools. North found a friend and formidable figure in Rev. James Cordiner, who was invited in 1799 to be the Chaplain-in-Charge of the Colombo Garrison. What Cordiner did, I will expound in a later essay. All that needs to be said of him at this point is that his arrival can be considered the starting point of attempts to resuscitate education in the country. These were not moved by sympathy for the natives, yet in this, they were far ahead, and more enlightened, than the vast majority of those in the Company who were not in favour of educating the people.